Whether you commute to work or school, you drive as part of your professional life, or you’re a parent who wants to keep the kids entertained on long drives, you’ve come to use your car stereo almost constantly. Depending on your tastes, this could include your radio, CD or MP3 player, Bluetooth, phone, GPS navigation or even an in-car DVD player to keep your family entertained. However, these all have one thing in common; not surprisingly, they all depend heavily on the stereo head. While most cars are factory set to pick up simple terrestrial radio and play CDs and MP3s, most people aren’t aware that there can be a whole world of choices for them to listen to and use to improve their driving experience. Fortunately, with a good car stereo system, you can do things with your music that you never even though about in the comfort of your car that are perfect for long trips, short trips, or even trips around the block. What you’re looking for is a new double DIN stereo unit to open up all of these wonderful possibilities. In 2015, the best double din head units are available with the latest advanced technology for you to evaluate and buy. 1 What is a Double Din Head Unit? 3 What Can a Double Din Car Stereo Do? First off, we should probably answer this question as well as “What is a stereo head?” The stereo head is the centerpiece of your stereo system that sits in the dashboard between the driver and front passenger seat. If you were to remove the stereo head, it would look like a small box. Inside that small box, however, are all the electronics that control everything that comes through your speaker system. It can range from the very basics, such as a radio and a CD player on stock models, up to some fancier features like a Wifi hotspot or a Bluetooth head unit. As for the double DIN part, it’s really just an international standard measurement. In the early 80’s, the Deutsches Institut für Normung (the German Institute for Standardization) standardized two sizes for car stereo heads. The first standard size for car stereo heads was 180 x 50mm, or about 7 inches wide by 2 inches tall, and became known as the Single DIN. The second size was also 180mm (7 inches) wide, but was 50 millimeters taller, bringing it to 100mm or 4 inches tall. Because this new size was twice as tall as the Single DIN, it became known as the 2 DIN car stereo. Nowadays, the most common setup is the 2 DIN car stereo. If you want to know which kind of stereo system your car has, just measure the front of the stereo head and you should easily be able to find out. Simply take a look at our double din head unit reviews and we’re sure you’ll find the perfect model to make your car feel uniquely yours. Designed for the consumer who wants to get the most possible use out of their stereo head, this model from Pioneer has plenty of options for every kind of user. 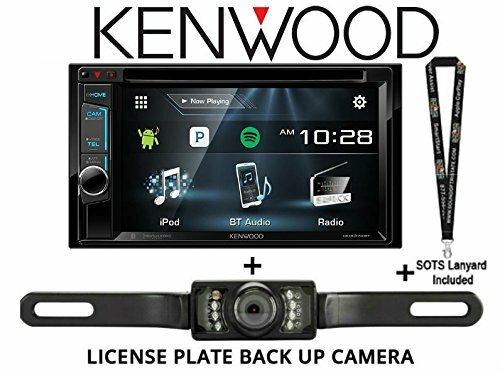 If you’re a parent who wants to keep kids entertained on long car trips, this stereo head has a DVD player with a 7 inch WVGA resolution touchscreen; whatever movie you choose to watch, it’ll be easy to see and, thanks to the touchscreen controls, easy to choose where to start and end. For the music lover, this head has three RCA 2v preouts for extra bass and tweeters, a simple point-and-click equalizer loaded with options, and Pioneer’s patented MIXTRAX program that takes your music library and automatically turns it into a non-stop club mix, letting you enjoy your favorite music in a whole new way. As for music, you’ve got all your basics for terrestrial radio, CDs, and connected USB devices like smartphones or MP3 players, as well as Pioneer’s MIXTRAX program to keep your music going non-stop as a fun club mix. 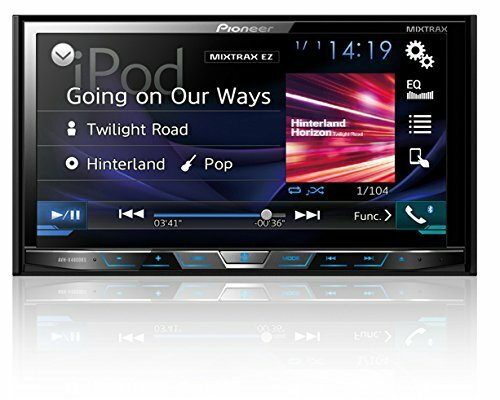 If you just want the basics and Bluetooth, you can’t go wrong with a Pioneer FH-X720BT Double DIN stereo head. Read our full review of this unit here. For those of us who are permanently wired in to our smartphones, you can finally get a stereo head that’s as connected to your devices as you are. Whether you’re using an Android or an Iphone, you can simply connect your smartphone via the one cable connection and not only charge your device, but play music and video directly from the stereo head with no loss in quality. In addition, this stereo head gives you the option to control certain apps on the head as well, perfect for anybody who relies on a GPS or other traffic related apps when they drive, or anybody who just wants their information on the go. This model is also good for streaming radio services, either through your phone or through a compatible audio box (sold separately), so anybody who has ever been unsure about subscribing to satellite radio can now rest assured; put it on your smartphone, and you can use it anywhere. Don’t let the lack of a touchscreen fool you; this stereo head from Kenwood gives you nothing but solid options in an easy-to-control package. You’ve got Bluetooth, you’ve got two-way Ipod and Iphone control for music files, and you’ve got on-board support for Pandora radio, all perfect for the one-hour commuter. With a phonebook button right on the stereo head’s face, you can easily access your Iphone’s contacts and, thanks to the Bluetooth and Siri controls, you can make calls without looking away from the road for even a second. With support for major streaming satellite radio services like SiriusXM and IheartRadio, it’s never been easier for you to buy a subscription on your phone, listen in your car, then unplug and take your radio with you, getting the most out of your subscription all the while. Simple enough that anyone can use it, but powerful enough to add some brand new features to your car, this stereo head combines a user-friendly interface with a solid set of features designed to please any listener. 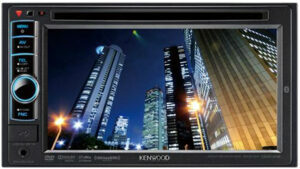 It’s easily our favorite Kenwood unit, along with the Kenwood DPX300U and DDX271, reviewed here. Simple to use, powerful enough to improve on your stock head in every way, and affordable enough for any budget, the KW-R910 can easily find its way into any driver’s setup. We consider this unit as one of the top JVC units available, explained in our review here. What Can a Double Din Car Stereo Do? Depending on what you really want your Double DIN stereo head to do, you have a huge variety of options ranging from audio options to in-dash DVD playback, Double DIN navigation, Double Din Bluetooth and, most interesting of all, touch screen apps that help you along the road. While there are a lot of options out there, the biggest names in the industry would be those companies who are synonymous with in-car audio and video technology, namely Pioneer, JVC, Kenwood, and Alpine. With a wide range of apps and connectivity options, you’ll easily be able to find a top-quality system that does everything you need. With all the great Double DIN touch screen systems on the market today, the best head unit is going to be the one that’s best for your needs. 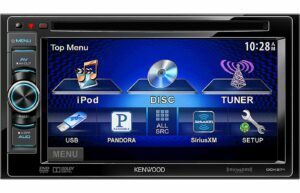 If you’re a big fan of incredibly balanced audio and satellite radio, you’ll find that a Kenwood Double DIN model is going to be to your liking. 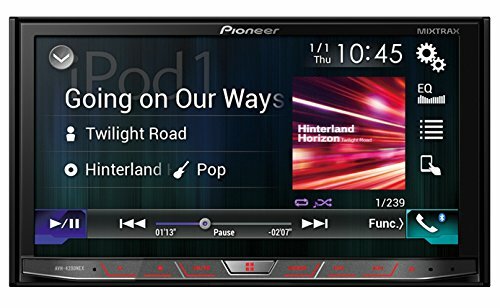 If, however, you would rather use your system as a mobile command center for your phone and GPS, you might prefer a Pioneer Double DIN, particularly their new AVH series. 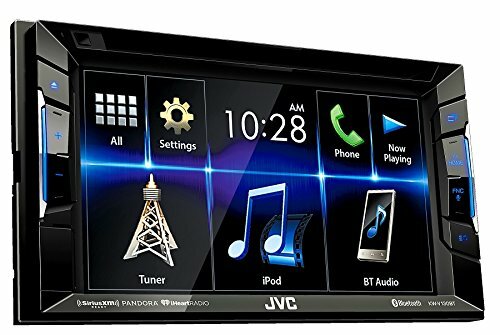 Still further, a parent who wants to set up an affordable Double DIN DVD player for their young children would really want a JVC Double DIN. You can trust that you’re making a good purchase with each one of these car head units, each one guaranteed to perform at a high level in your car. Of course, like all important purchases, you first need to do some homework of your own. While you could get the most comprehensive system on the market and easily install it into your car, you might find that you could pay half as much for a stereo system that just does what you need. As with most additions to your car, you should see what the dealers recommend by either checking your car’s model online or by speaking to your car dealer. Because these systems are all going to be Double DINs, they’ll probably all fit; however, it may be easier to install certain models on certain cars, and unless you want to pay someone to install your system, having the right head unit for your car can save you a lot of headaches. While it may seem like an intimidating task to upgrade your factory car stereo for a more robust model, it is actually one of the easiest possible ways to make your car feel more comfortable. If you’ve ever wanted to bring your car into the twenty-first century with a fantastic new head unit, we’re here to make it as easy for you as possible to find the best double DIN head unit for you. The article is very informative and useful. would like to know the performance of Map My India car system and about its after sales service. I recently purchased a targa double din model no tdd gp 765 usb with internet browser but im having trouble setting up the browser.iv tried different usb modems but nothing works pls help.contact me on whatsapp 0824838310.or email me jmoolgie@gmail.com.pls anyone help. When will Kenwood have the DDX 9903S for sale that was introduced at CES? You need to answer the rhetorical question posed regarding the double DIN head unit. In the early 80’s, the Deutsches Institut für Normung (the German Institute for Standardization) standardized two sizes for car stereo heads. The first standard size for car stereo heads was 180 x 50mm, or about 7 inches wide by 2 inches tall, and became known as the Single DIN.